Stephanie has been in Korea since August 2009 and Sean was there at the same time until this Christmas. He is staying in Canada to finish a couple of semesters at UNB to finish his degree. Stephanie has always been a fan of travel and foreign countries. She doesn't get that from neither her mom or dad.. as we are not that adventurous. Stephanie has had the privilege of foreign travel since she was 13. Her first experience was to spend a month in Japan during the summer with a host family, then, two years later at 15, she spent two months in Japan, both going to school and living in a rural community. Michelle also travelled to Tokyo for two months.. staying with host families and going to school. Stephanie spent a month in Belize, living in a camp in the jungle, digging with an archeology group, as well as spending a month in Mexico and Guatemala travelling the small villages and communities, studying the textiles of the people and their craft. Korea was totally foreign to her, though, more than she expected. Being very familiar with Japan and its ways, we all expected Korea to be some what similar in customs, habits, living conditions, etc. Not so much! As I have mentioned before, through the wonders of Skype, we have stayed connected to Stephanie and Sean, just like they were down the street. The biggest difference is they are always 12-13 hours ahead of us. When I am starting my morning at 6am, Stephanie has completed her work day and is making supper, when I am eating my breakfast. With Stephanie's first contract, she was given a one room apartment on the ground floor of a "not very secure" building. Above, you will see, her whole apartment, with patio doors that lead to her washing machine, but do not go outside. She stood in her entry way, which is also the kitchen, to take this picture. She and Sean endured the year there, but when it was time to sign for a second contract, she insisted on a better apartment in a better area, with more security. The theory behind this was that with Sean going, and it would be safer for Stephanie. Well, her company came through with a new place, that was luxurious compared to her old one. This new apartment, is on the second floor of a three floored building, with secure entry. It has two rooms, not just one. This is her living room, dining room, along with a very useful closet. Sean took over the closet, and set it up as an office! This is from the front door, and shows all the way to the end of the apt. To the left, in the picture is the kitchen, which also is the laundry room. The apartment comes with a washer. The drying racks for clothes are hooked to the ceiling of the kitchen. there are no ovens in Korean homes, and the fridge is located in the living room, as there is no room in the kitchen. But the flooring is warm, the walls are straight, the woodwork is beautiful and it has lovely sliding doors between the bedroom, the kitchen, bathroom and main room. Very efficient design features for small spaces. 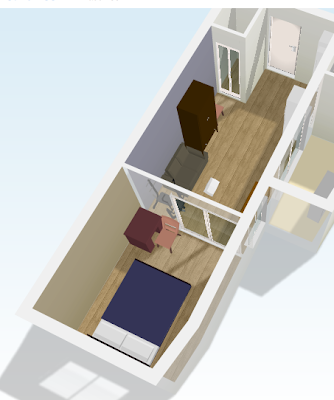 While this place is huge compared to her first home, below you will see the two designs she just put together, to use for moving her furniture around for better planning. In my world... that is still tiny. But she loves it, and I can understand why. She owns very little, and everything she owns is little. Her bathroom, which you can't see, is ahead of the kitchen. In Korea, as with lots of other Asian countries, the shower, sink and toilet are all in one tiny room. 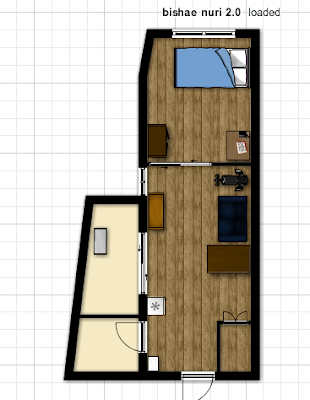 This is the design she plans on, when she gets a normal size bed. The bed she and Sean have been sleeping in for the past 18 months was a semi single. 45 inch bed. She plans on a Double to Queen bed purchase soon! 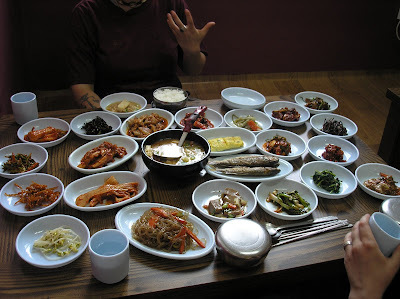 Something I would have a huge problem with in Korea, is the food. Stephanie, although very adventurous when it comes to food, is getting tired of it all. Spending time this Christmas at home got her in touch with K-Dinner again, and bread... cheese, raw veggies and meat. Sean, on the other hand, is here in Canada and missing the Korean food terribly!!! Below, you will see what a lunch in a restaurant sometimes entails. You are brought all these little dishes, you pick and chose your "eats" and the hostess will come by and refill your little buffet of items that are depleted. Not too much I would try, I am afraid! Again, not adventurous! Stephanie's biggest problem with the food, is her school lunches, which she is obligated to eat. It is expected, and she never quite knows what she is eating! She plans on doing a series of blogs to highlight her lunch time adventures! There are good days and some really bad days! Its an amazing experience for all of us. I am so proud of Stephanie for her bravery and sense of adventure! Love all the pics especially the layout ! I enjoyed this post soooo much. I love to learn about new things. I am in awe of Stephanie's adventurous spirit...there is no way that I could imagine leaving the comforts and familiarity of home to go off to a new country...so happy that she is embracing the opportunities that are coming her way! When will the snow go away?